Why did Governor Jerry Brown Take So Long To Declare An Emergency? Because his sister is on the board of Sempra Energy, the parent company of SoCal. Where is the U.S. Federal Government in the midst of the worst natural gas catastrophe in American history? The distractions are now coming so fast and furious that few can process the totally manmade catastrophe that is taking shape in the San Fernando Valley just northwest of the city of Los Angeles. As far as natural gas leaks are concerned, they simply don’t get any bigger than the one spewing methane in Aliso Canyon. Truly, this is the “BP oil spill on land!” as Erin Brockovich was recently quoted. One of the editors of The Millennium Report worked 7 days a week, 16 hours a day on the BP Gulf oil spill for many months. That leak was in water and way out in the Macondo Prospect 5000 feet deep in the Gulf of Mexico. This hydrocarbon leak at Aliso Canyon is located in the most populous county in the nation as Los Angeles County recently surpassed the 10,000,000 mark. 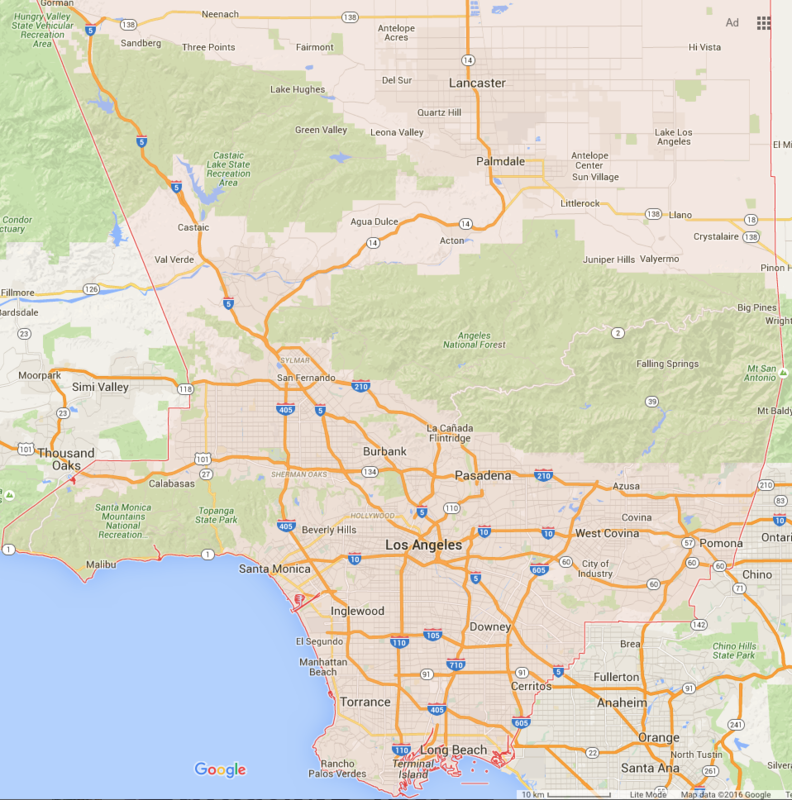 The map of LA County below indicates San Fernando just north of LA proper. Just west of there are the upscale communities of Porter Ranch and Granada Hills; that’s where the methane volcano has been spewing nonstop since October 23rd. What’s the point of this SOS? One of the most populated metropolitan areas in the nation is the site of a ginormous natural gas leak that threatens the entire region. Porter Ranch has already evacuated 2500 households with another 2500 to 5000 in process. The population density of this particular area is such that upwards of 30 to 50,000 residents may ultimately be evacuated. YES, IT’S THAT SERIOUS! For the time being, everything depends on the weather patterns. Blue clear skies permit the methane to rise and disperse although it still poses huge problems to the environment because of its decomposition time and temperature. Low pressure days and chemtrail-fabricated cloud cover, on the other hand, will cause the methane plumes to hover closer to the ground. The more that the well-gone-bad leaks, the more that natural gas will accumulate here and there however the ambient atmosphere permits. There is no question that the extraordinary outflow of methane has already caused concentrations of natural gas to occur in a metro area which have never — EVER — been seen before—ANYWHERE! Lest the reader doubt that California is right now facing the greatest manmade environmental disaster in its history, the following two articles have been posted in their entirety for further edification. It now looks like the catastrophic Porter Ranch gas leak, which has spewed more than 83,000 metric tons of noxious methane for nearly three months, has spread across Los Angeles’s San Fernando Valley. On Wednesday, Los Angeles City Councilman Mitchell Englander called on the Southern California Gas Co. to extend residential relocation assistance to residents in Granada Hills, Chatsworth and Northridge who live near the Aliso Canyon gas leak above Porter Ranch. These residents reported symptoms related to the exposure of natural gas such as nausea, vomiting, headaches and respiratory problems. This latest development compounds with a new analysis from Home Energy Efficiency Team (HEET). The Cambridge-based nonprofit sent Boston University Professor Nathan Phillips and Bob Ackley of Gas Safety to take methane measurements around the San Fernando Valley for several days and their findings were disturbing. “It’s not just in Porter Ranch, it’s going all the way across the [San Fernando] Valley,” Ackley told Inside Climate News. 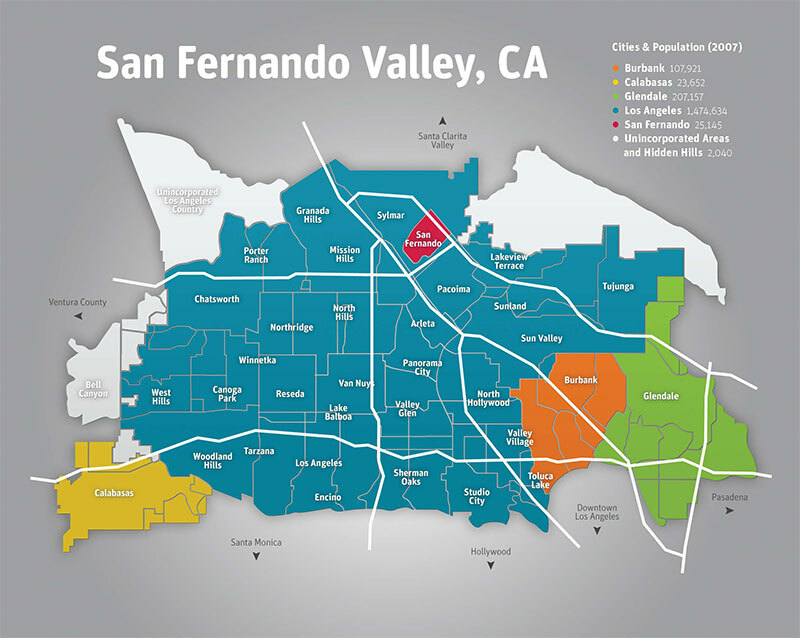 According to HEET, the researchers drove a high precision GIS-enabled natural gas analyzer down the roads around the gas leak to create a comprehensive map of the leak around San Fernando Valley. The red on the map indicates where they drove and the levels of methane they found is shown by the height of the peaks. Their monitors showed methane levels at 3.4 parts per billion, about twice the level of natural clean air, the Los Angeles Daily News reported. Another measurement showed 127 ppm, or an astounding 67 times above normal. Dozens of public health and environmental advocates and experts will rally at the U.S. Environmental Protection Agency headquarters in Washington, DC tomorrow to press for federal action on the Porter Ranch leak. Friday’s rally, organized by members from Food & Water Watch and other organizations, will ask the U.S. EPA to intercede and permanently shut down operations at a blown-out gas storage facility in California. Southern California Gas Co. has evacuated more than 2,000 residents living near the leak since October. Porter Ranch was officially declared a state of emergency by California Gov. Jerry Brown, however, advocates have criticized his slow response to the escalating public health crisis. On Saturday, in Granada Hills, California, hundreds of residents of Porter Ranch will rally and testify at the second hearing on a stipulated Order for Abatement—which requires a company operating out of compliance to take specific actions or to shut down its operation to come into compliance—over the Porter Ranch Gas Leak. Southern California Gas Co. said in a statement that methane leakage has been slowly falling. Estimates by the California Air Resources Board showed an estimated 60-percent reduction from peak levels in late November. The gas company is currently drilling a relief well in an effort to plug the leak, the Los Angeles Daily News reported. The effort, however, could take months. “We’ve drilled to a depth of approximately 7,000 feet (and) we have to drill to a depth of over 8,000 feet, and remain on schedule to complete this process between late February and late March,” company spokesman Raul Gordillo said. The findings by independent researchers raise potential health concerns for people living outside the immediate vicinity of the Aliso Canyon gas leak. 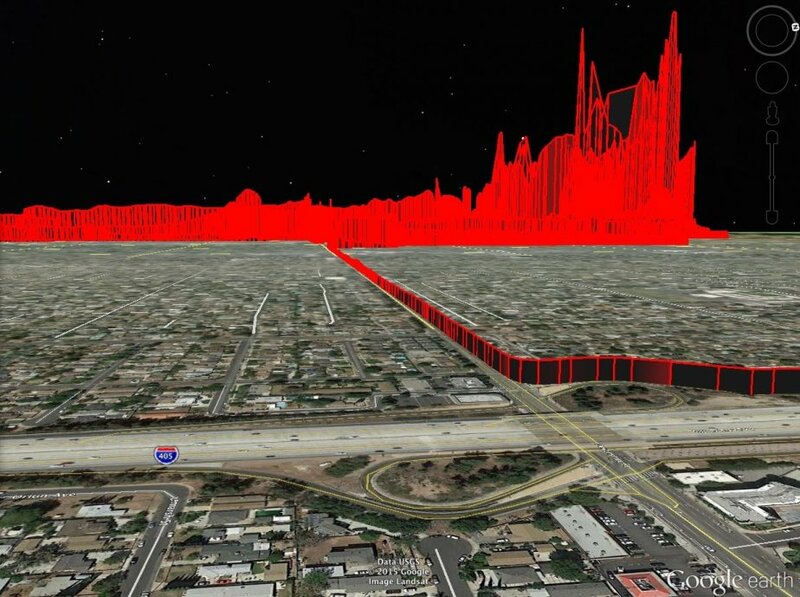 This data visualization shows the methane plume from the Aliso Canyon gas leak (in red) extending well beyond Porter Ranch on the right to neighboring Northridge on the left. The readings for this visualization were taken on Jan. 12, 2016. Courtesy of Home Energy Efficiency Team and Google Earth. Independent researchers reported detecting elevated methane levels as far as 8 miles from the massive, ongoing leak of natural gas from a storage site in northwestern Los Angeles. A ruptured well at Southern California Gas Co.’s Aliso Canyon underground facility has spewed more than 80,000 metric tons of methane into the atmosphere since the leak was discovered Oct. 23. The release of the powerful greenhouse gas led to the evacuation of thousands of people from the affluent Porter Ranch neighborhood a mile from the leak after reports by residents of nosebleeds, rashes, headaches and nausea. Finding elevated methane levels well beyond the Porter Ranch area raises potential health concerns for people living outside the immediate vicinity of the leak, the researchers said. Inhaling low concentrations of methane, the primary component of natural gas, is generally not considered a health concern, but natural gas often contains trace amounts of other, more harmful gases. The findings challenge assurances from the South Coast Air Quality Management District, the regional air pollution control agency, and the state’s Office of Environmental Health Hazard Assessment that the leak hasn’t increased residents’ exposure to toxic gases. The cumulative methane emissions from the Aliso Canyon facility to date have the greenhouse gas equivalent on the Earth’s atmosphere of burning nearly 800 million gallons of gasoline, according to the Environmental Defense Fund. On Wednesday Los Angeles City Councilman Mitchell Englander called on SoCal Gas to extend its residential relocation program to residents of neighborhoods adjacent to Porter Ranch, according to the Los Angeles Daily News. People in these communities were also reporting similar symptoms related to the leaking gas, according to the paper. SoCal Gas spokeswoman Kristine Lloyd said the gas company is providing temporary accommodation and air filtration for residents within a five-mile radius of the leak, extending beyond Porter Ranch. Democratic U.S. Sens. Barbara Boxer and Dianne Feinstein of California sent a letter to the Department of Transportation, the Environmental Protection Agency and the Department of Justice Wednesday calling on the federal agencies to offer further assistance to the State of California in responding to the gas leak. 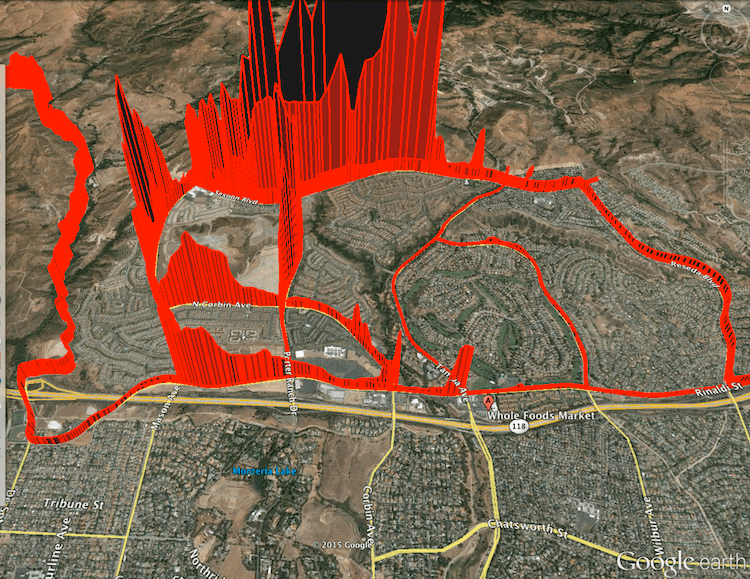 In a mapping effort funded by the Home Energy Efficiency Team, a Cambridge, Mass., nonprofit, Phillips and Robert Ackley of Gas Safety Inc. measured methane emissions for the past several days near the Aliso Canyon leak. Gas Safety Inc. provides natural gas leak detection services to industry, businesses and homeowners. They used a laser-based system mounted to a car. 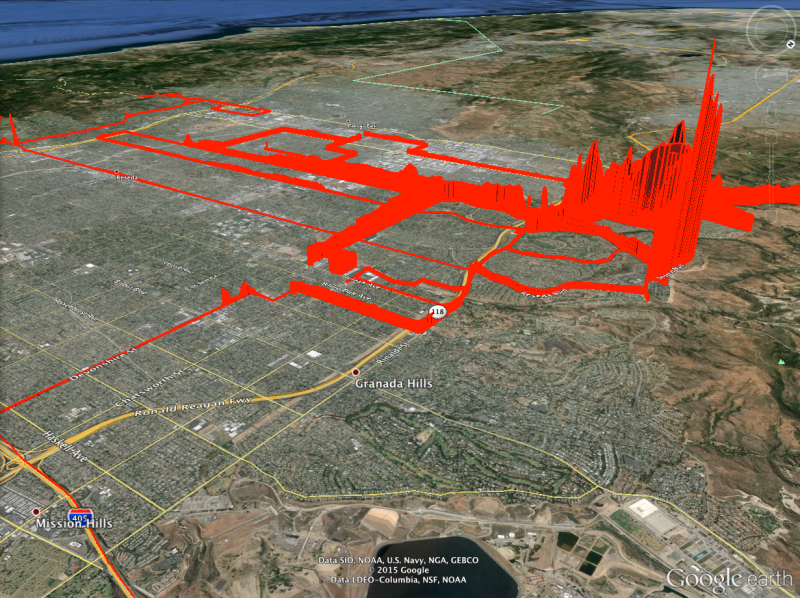 It recorded methane concentrations and plotted the readings on Google Earth. On Tuesday and Wednesday the researchers drove further from the leak and recorded methane concentrations as much as two times higher than background levels, as far as 8 miles away from the site. “It’s not just in Porter Ranch, it’s going all the way across the [San Fernando] Valley,” Ackley said of the methane plume. The valley is home to 1.8 million people including Northridge, Winnetka and Woodland Hills, neighborhoods across the valley where the researchers confirmed increased methane concentrations. The agency said the symptoms reported by many Porter Ranch residents can be attributed to mercaptan, an odorant added to the otherwise odorless natural gas. Mercaptan smells like rotten eggs and helps in leak detection. “These odors can evoke physiological responses (e.g. nausea, headaches) without inducing more serious or longer-lasting health effects, such as eye, or respiratory system damage,” the office said. Independent scientists, however, questioned those findings. The “acute” guideline is “the most cautious interpretation you could take,” Michael Jerrett, the chair of the UCLA Department of Environmental Health Sciences, told the Los Angeles Daily News. Acute guidelines focus on health effects from breathing significantly elevated levels of benzene over a short period but don’t assess the health effects of inhaling lower levels over a longer time. “There’s a potential here for health effects that could be experienced long term,” Jerrett told the paper. Phillips made the same point. “We are going in for a half hour at a time to check out the plume, but if I had that as a constant condition in my place of work or home, I would definitely be concerned about it,” Phillips said. The Office of Environmental Health Hazard Assessment’s analysis was based on measurements that were collected twice daily. “One thing I was most struck by was the inadequacy of once or twice a day sampling stations,” said Robert Jackson, an earth system science professor at Stanford University who joined Phillips and Ackley in taking methane readings over the weekend. “There is an array of a dozen sampling stations that sample gases once or twice a day,” Jackson said. “The area needs more real-time continuous sampling.” There should also be additional sampling locations outside the Porter Ranch neighborhood, he said. The South Coast Air Quality Management District has taken 24-hour readings on six days in Porter Ranch since Dec. 21. Phillips disputed the characterization of low levels of benzene and other toxic compounds.